Video sponsored by Label M.
The skin fade haircut is my go-to for summer. I’m going for a contrast in length by keeping the top full and long, styling into a groomed side pomp. Because my hair is fine and straight, I’ve gone super-short (right down to the skin) on the back and sides. For a juxtaposition in length, I’ve kept the hair full on top; with minimal texture for a groomed finish. See the step-by-step guide below or in the video and the bottom of this article.. Tight around the neck and the sides of your head. Tapered from your skin, up to a 1.5 clipper grade. Depending which way you style your hair, ask for your hair to be cut slightly shorter on the side that the hair will rest on – i.e. I style my hair from right to left, so the left side is shorter than the right. After washing and conditioning my hair, Label M Grooming Cream is applied throughout my hair. Using this as a cutting agent, it helps to keep the hair in sections and also add a very light hold. My hair is then sectioned to create a horseshoe – higher in the recession area at the front and lower at the back. This helps to build a stronger silhouette. Working with a clipper grade 1.5, the excess hair is first removed. 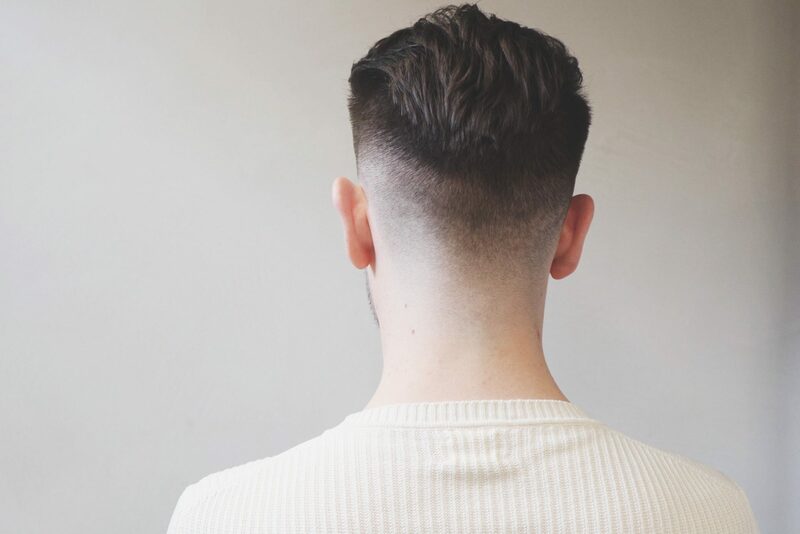 From there, we go straight in with the shortest clipper length – a 0/zero – to achieve the skin fade. A weight line (the part of your hair cut that holds the most weight) is then placed around the hair, almost mirroring the horseshoe. To keep it as short and neat as possible, mini trimmers are used around the neck and ears. From the 0, we fade up using the tapering arm of the clipper to go progressively from a 0 to a 0.5. We then go from a 0.5 on the arm, tapering up to a 1.5. Using scissor over comb, we then get rid of the weight line in the hair. The crown is first separated – to connect to the back and build up a slight graduation. We then work from short to long using a point cut (cutting the hair with the scissors positioned vertically) – maintaining the majority of the length on the right side and slightly shorter on the left side. Having different lengths ensures that the disconnection doesn’t look so heavy on the side that the hair will sit. Once cut, we use Label M Sea Salt Spray throughout the top. Using a brush (you can use hands), we begin to direct the hair in the way we want it to sit. This is a bit of a pre-styling trick, to first to see if there are any other areas we need to work on. As I have a very low hairline, we use a razor to taper the hair line on the skin at the back of my head. After rinsing the hair, we use Label M Scalp Tonic to freshen the scalp. Roughly six pumps of Sea Salt Spray are then distributed through my hair – blow drying with a brush to work the product throughout the hair. Sweeping the hair up and back, from right to left, we build volume in the hair until we are happy with the style and finish. Tip: I’m using sea salt spray to give my hair a loose, summer, beachy finish. If you want something more defined and structured, you can use Label M’s Deconstructor to lock the style in place. This is my summer style. If you share yours on label-me.com you could win the opportunity to become the next face of label.m… and some other pretty epic prizes! Hair cut by Charlie Cullen, Artistic Director at TONI&GUY barbershop in Shoreditch, London.